Area Wells Still Filled With Jet Fuel, But Don’t Worry About It! The front page of today’s Barbados Advocate reads “All Clear For Shell Pipeline”. The story tells how Shell Oil hired an environmental consulting company called ERM to do a “study” of the contamination caused by spilled fuel from Shell’s leaky airport pipeline. Surprise surprise! Everything is okay, don’t you know! Please excuse me for having my doubts — because five minutes of research on the Internet showed that Environmental Resources Management ERM has been on the Shell Oil payroll for 20 years and has made millions of dollars handling Shell Oil’s sticky wicket environmental situations. That includes Africa too – and we all know about Shell in Africa, don’t we? The ERM company website even brags about ensuring that government officials “buy-in to strategy” and how ERM personnel “achieve tacit upfront regulatory acceptance” – meaning that ERM are experts in getting government officials to see things to Shell Oil’s benefit. In the Shell Haven Refinery case listed in Google’s database, the UK government originally demanded a $140 million dollar site clean-up, but ERM reduced that to a far nicer number for Shell Oil: $14 million. Please excuse me for having doubts about the independence of a company that has banked millions of dollars from Shell Oil contracts over the last 20 years and brags about its ability to have government officials “buy-in” to Shell’s plans. Not to mention that in Barbados we have no laws that prohibit government officials from receiving gifts or benefits from corporations that need them to provide approvals. You see, it is still legal in Barbados for elected or appointed government officials to use their offices for personal gain. So once again, please forgive me if I have some doubts. 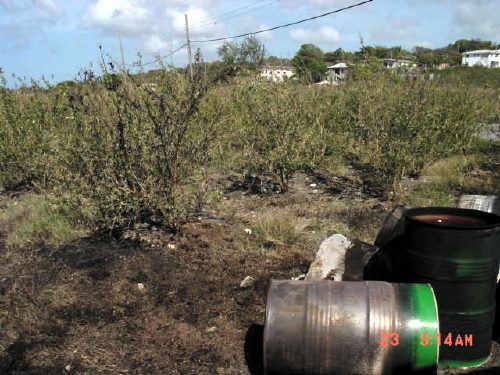 Oh… how much in “campaign donations” did Shell Oil give to Barbados politicians? There are no laws that govern such donations and you have no right to know about it! And then there is the little matter that neither the DLP nor the BLP government even passed a simple law compelling pipeline owners to make daily measurements and report any leakage to the government! Shell Oil never kept leakage records or filed them with the government. Meaning that nobody has any idea of the exact amount of Shell jet fuel that leaked into our water table over a ten or twelve year period! What About Those Wells Filled With Jet Fuel? Today, (Thursday 3rd January 2008), I visited Oistins at the Southern Farmers request and witnessed a bucket being lowered into a well close to the road and where an Urban Development project is taken place. The well was about 500 feet from the beach and when the bucket was lifted it contained what appeared to be almost pure kerosene. Do You Trust Shell Oil’s “Everything Is Okay” Report? Sorry folks, but I still have big doubts about this Shell report. How about you?